Lotus is a family business crafted by generations of shipbuilders and geographical expertise, enabling them to offer Asia’s most luxurious collection of boutique river ships combined with a magnificent voyage of discovery along the mighty Mekong. 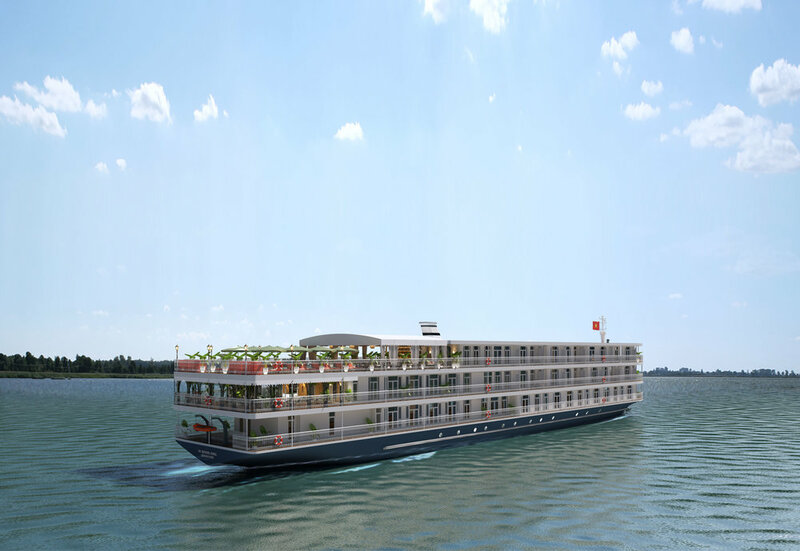 The Mekong Jewel is the latest addition to the collection, offering 34 indulgent suites with onboard facilities that set new standards in all aspects of elite river cruising. Each suite offers high ceilings and meticulous attention to every opulent detail, luxurious marbled bathroom and a private balcony with landscape vistas. Spacious amenities feature a unique sundeck with jet pool and the panoramic Sapphire Sky Lounge, a choice of cosmopolitan dining experiences, and a full fitness centre with spa, infra-red sauna and hairdresser. Guests can choose to dine at Jade Spirit, the casual al fresco restaurant with glass curtains for breezier days or in the elegant atmosphere of the Emerald Dining Room serving chef’s regional signature dishes as well as western alternatives. There’s a charming climate-controlled lounge to meet up with new friends and a library with an excellent selection of books about ancient Indochina. In addition to a diverse and comprehensive land itinerary which includes such highlights as the ancient temples of Angkor Wat, the spectacular Royal Palace in Phnom Penh, a water blessing by the monks of Wat Arang and the French architecture of the Opera House in Ho Chi Minh City, there’s also a well-crafted cultural and culinary programme on board offering Khmer national dance displays, a traditional shadow puppet show and regional cookery classes. Lotus have created a rich and unforgettable travel experience along the mighty Mekong, navigating through magnificent remnants of former civilisations with a dedicated guide, exploring vibrant floating markets by sampan contrasted by a slower pace of life along the riverbanks where herds of water buffalo idle in the green fields and villagers continue time honoured artisanship. And this all comes with the peace of mind of knowing that there are no hidden costs. From the outstanding professional service to land excursions, meals, self-service laundry facilities and gratuities, everything is included in the price, allowing guests to relax and feel enriched by this new experience, new connections, authentic flavours and historic knowledge. Signing up to this experience before 31st May comes with the added bonus of a special offer of 2 free additional nights in 5* hotels when booking a 7-night cruise, creating the opportunity to explore Ho Chi Minh City as well as Siem Reap before and after the cruise, with all airport transfers included.